A TRUE Software with NO INSTALLATION ! AstroQuick 7 is a "web app", a new genereration of web application that works with any computer connected to internet. No installation is required, this software works with just a web browser. Unlike the old software which requires CDs, downloads, installations, patches and settings, a web app never suffers from incompatibilities or system bug! When the system or the browser has been updated, a software web app fits without difficulty, it stays always accessible and consistent, even with the constant evolution of personal computers and mobile devices. After many years of research and developments, AstroQuick 7 was created and optimized to give the best flexibility ever by finding solutions very quickly, even with a low-speed Internet connection. Thanks to the use open source dev tools, AstroQuick is 100% compatible with any recent web browsers ***, which actually is 100% of the computers (PC, MAC or mobiles). AstroQuick files are also 100% compatible with any words or pictures processing softwares as well as any printers. AstroQuick Web is multi-device, you can use any computer connected to the internet to find your personal data on the software with your preferences. You will always be able to stay connected to your astrological software and to your charts even after a system error or the loss of your hard disk ! 100% free from operating systems. 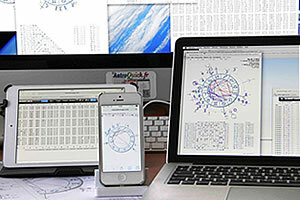 AstroQuick 7 is made with open source softwares that have been improved by a lot of people ***. That means there is no connection with incompatibilities and obsolescences imposed by the major systems evolutions, and does not depend on any computer builder or economic downturn. Even if you think it is not important now, the fact that there are no consequences for you is good for a use of the software in the long term. No installing. No setting : you will buy some time, especially if you change your system or even your computer. Costs and deadlines reduced : no cd will be mailed to you, no upgrade to buy, install or reinstall. You will enjoy these savings and it is also eco-friendly ! Centralized data: your charts are accessible from any PC in the whole wide world, you won't need to synchronize anything ! A software and data that are always up-to-date ! Seasonal data and hourly systems are always updated, same for celebrities birth dates, the geographic atlas etc. In case of a bug correction or new functions to use, they will be provided as soon as possible on any computer (PC, Mac, iPhone etc.). An exceptional mobility: your astrological graphic software is the lightest on earth ! Take it wherever you want on your cell phone, iPhone™, iPod™, iPad™ or MiniPC netbook... And even with no computer because you only need your login (name and password) to log on from a friend's computer or a coffee shop. THE FIRST astrological software with no installation ! Since they were launched, AstroQuick softwares have remained number one in the innovation as for computerized astrology with the first astrological multi-window software on Mac OS 7 in 1993 and on Windows 3 in 1994, with for the first time editorial and personalized interpretations. In 1999 was launched AstroQuick Mac 5 and it will remain the most used and rewarded astrological software on Mac OS 9 according to the media. Astroquick softwares have inspired several generations of astrological softwares, many times copied... never imitated. Quality can't be improvised, AstroQuick is the result of experience, work and above all passion that has never been doubted for about two decades now. This is the software that will really make astrology easy for you in so little time ! Starting now you can use AstroQuick Web 7, the first astrological graphic web app. No more constraint, get a taste of freedom ! Updates of micro-computers or systems are becoming more and more frequent, as well as softwares that must be constantly upgraded. A desktop, a laptop, a tablet, a smartphone... the more machines, the more technological constraints, settings and failures ! Nowadays, choosing between a cd-rom to buy, install, set up and update or an online software to only use, it's like choosing between spending your time trying to fix problems, or on the other side, simply practicing Astrology. Thanks to the quality of AstroQuick softwares you will get so much more time to practice Astrology. The motto we have had for over 20 years is pretty meaningful. Choosing AstroQuick Web today is being sure to use a powerful astrological software, always up-to-date and operational, even on old computers! You will also save money because you will know exactly what you are spending it on. You are guaranteed to practice astrology freely, when and wherever you want it, with no computer constraint. Consequently, AstroQuick will never make you waste your time ! * The average time to write a birth chart page is 0,05 second. ** Microsoft™ Internet explorer™ is compatible starting with the version 8.